Your academic work can make a positive impact on people’s lives. 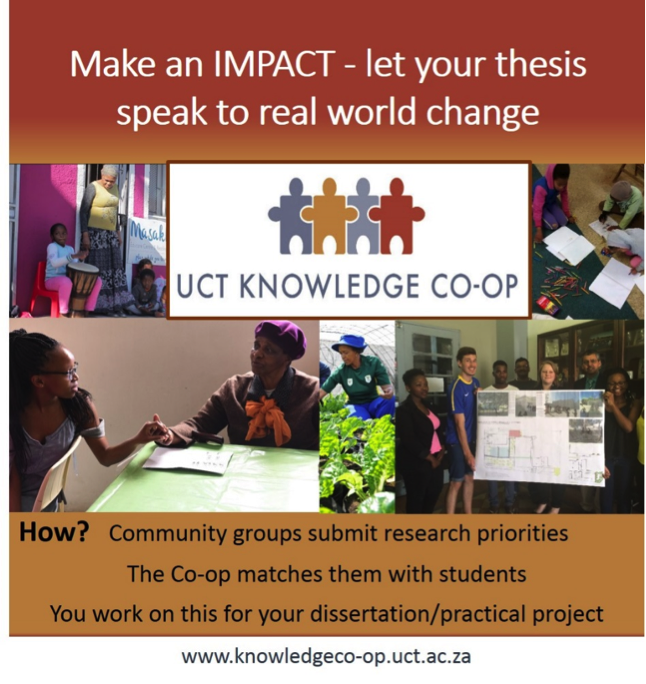 The UCT Knowledge Co-op encourages collaborative research projects. Where possible, it brings together a community partner with suitable disciplines and facilitates the development and successful completion of projects. Students, supervised by academic staff - or staff members themselves - may take on projects. In each project, the work they do will benefit the community partners and also contribute to their academic requirements. We call it ‘Putting knowledge to work for communities’. To book your place in our info session please click the "Begin Registration" button below and enter your details.